Achieving success in the world of Private Equity requires technical financial mastery, confidence, drive, resilience and grit -- as well as a highly effective set of relationship development and relationship management skills. Private Equity professionals must develop, manage and grow relationships with a vast and sophisticated network of investors, advisors, lawyers, tax professionals, consultants, bankers, internal partners, corporate boards, portfolio company executives and employees... just to mention a few. Deals often come together quickly, are highly competitive and, when complete, will present the Private Equity professional with a seemingly endless stream of deal-making hurdles, high pressure operational challenges, conflict resolution situations and complex interpersonal interactions. The Private Equity professional must navigate these obstacles while facilitating enormous change for portfolio companies and their teams. Private Equity, simply stated, is an emotionally charged, high-degree-of-difficulty business ecosystem. Private Equity professionals must master the financial components of their craft but also achieve high levels of social and emotional intelligence. 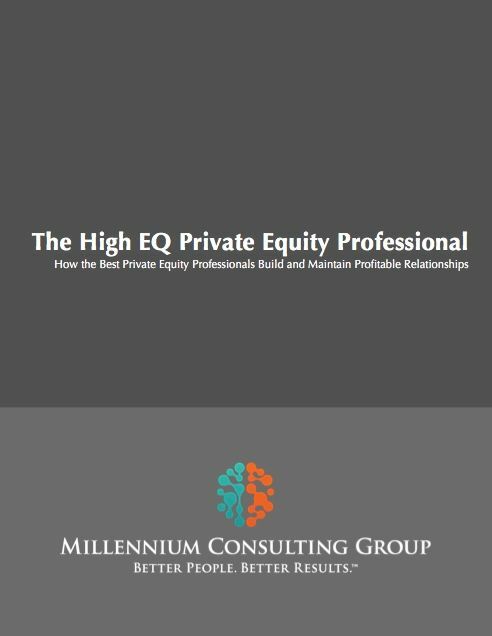 For the elite Private Equity professional, high financial IQ's, diplomas from elite universities and extensive operational experience are "table stakes.” But to become one of the best, a high EQ is an essential ingredient for initial survival and, ultimately, for sustained long-term high performance. Our High EQ Private Equity Professional Workshop is designed to immediately and positively impact participant EQ levels by working with them to understand and develop the personal development and relationship development mindsets and skill sets of the most successful Private Equity players. This fast paced, highly practical and highly interactive program takes the EQ discussion beyond general theory by delivering industry specific functional best-practices that will challenge participants to elevate the quality of their personal growth and relationship development efforts.